Ryan Mathews is unlikely to be back with the Eagles in 2017. The 2016 Philadelphia Eagles season is essentially over, so with three games remaining, we'll start to look ahead to the offseason. As a starting point, let's take a look at each position and figure out which players will be back in 2017. We started with the quarterbacks this morning. Should the Eagles put in a waiver claim on Michael Floyd? This afternoon, we'll look at the running backs. From 2010-2016, Mathews has appeared on the injury report 56 times. In 2016, Mathews has "only" missed two games, which is better than normal. On the field, Mathews is a hard runner who has played well at times, and has decent numbers. On the season, Mathews has rushed 117 times for 487 yards and 7 TDs. Unfortunately, his fumble against the Detroit Lions arguably cost the Eagles a game. Two weeks later he fumbled in clock-killing time once again against the Minnesota Vikings. 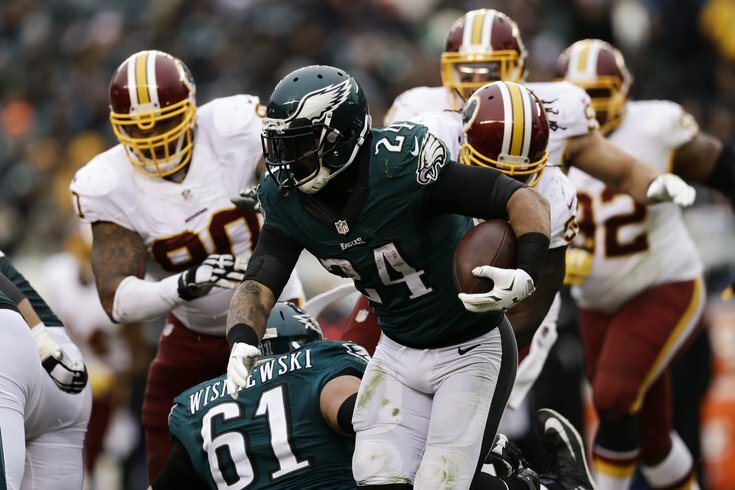 That damaged the Eagles' trust in Mathews, as he carried the ball just nine times over the next two games. In 2015, Mathews lost three fumbles on 106 carries. In 2017, Mathews will count for $5 million against the salary cap, $4 million of which the Eagles can save if they trade or cut him. For a guy who is always injured and has ball security issues, it feels like a no-brainer to move on. Sproles has been perhaps the Eagles' most consistent skill position player this season, carrying the ball 78 times for 366 yards (4.7 YPC) and 1 TD, while chipping in 47 receptions for 400 yards and 2 TDs. He also remains one of the most dangerous punt returners in the NFL. This past offseason, Sproles hypothesized that he has two good seasons left and that he wanted to retire as an Eagle. That would take him through 2017, and the Eagles would obviously welcome him back next season. Smallwood had his ups and downs as a rookie this season, which is now over after he suffered an MCL sprain against the Washington Redskins. His best moments came in the Eagles' blowout win over the Pittsburgh Steelers when he ran 17 times for 79 yards and a touchdown. His worst moment came in the Eagles' loss at Dallas, when he inexcusably fumbled with a 10-point lead, leading to a Cowboys field goal. On the season, Smallwood rushed 77 times for 312 yards (4.1 YPC) and 1 TD. He caught 6 passes for 55 yards and no scores. Smallwood showed enough this season for the Eagles to feel confident that they have a contributor in the backfield going forward, but not so much that Smallwood showed that he can be trusted as a three-down back at this stage in his career. The Eagles will almost certainly work extensively on Smallwood's pass protection next offseason. Barner hasn't gotten many opportunities this season, but when he has, he has made the most of them. On the season, Barner has 24 carries for 123 yards and 2 TDs. He also showed that he can be a competent kickoff returner, as he had a 61-yard return against the Bengals. This offseason, Barner will be a restricted free agent. That could get pricey. Last offseason, the Eagles signed Matt Tobin to the lowest possible restricted free agent tender possible, which cost them $1.67 million. That stopped him from becoming an unrestricted free agent. They later re-signed Tobin to a two-year deal that essentially served as little more than a pay cut. They were able to successfully retain Tobin, then get him to agree to a deal that was more palatable to the team. The Eagles could attempt the same strategy with Barner, but if he is unwilling to work out a more team-friendly deal, I would not keep a fourth running back on the roster for almost $2 million. #JimmyVerdict: Stay, as long as Barner is willing to take a team-friendly deal.